A sole agency agreement is an agreement between two parties--a principal and an agent--in which the principal agrees to allow the agent to perform legal acts on his behalf. 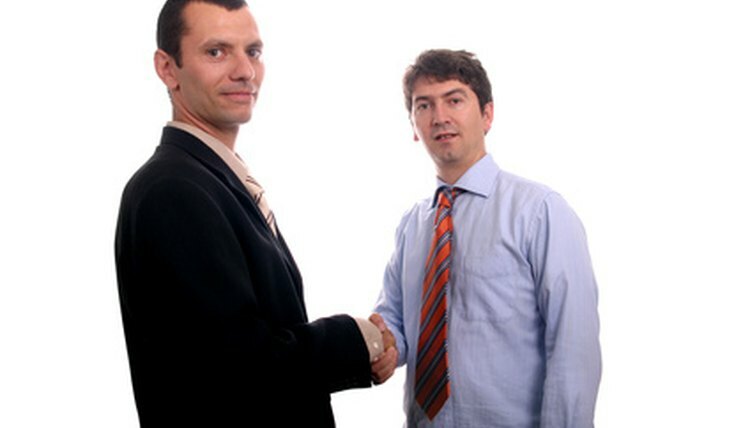 Sole agency agreements are normally used to sell or market products. Since agency law is a distinct and well-developed body of law, care must be taken when drafting a sole agency agreement in order to avoid unintended legal consequences. Draft an appointment clause in which the principal formally appoints the agent to perform specified tasks on the principal's behalf, and the principal accepts the appointment. Both parties should be clearly identified--legal names and social security numbers or tax ID numbers should be used. A one-sentence, general introduction of the agent's responsibilities should be enough for this section. This section should also specify that the agency is exclusive. State the duration of the agreement. The agency may end on a certain date, upon the occurrence of a certain event, or upon the principal's withdrawal of the agent's authority by written notice. It is best to set a specific date if possible, so that third parties will not be confused about whether or not the agent's authority is still valid. Outline the agent's responsibilities and scope of authority. This is a particularly important section, because since the agent has the authority to perform legal acts (such as signing contracts) that bind the principal even after the agency agreement expires, a broadly worded grant of authority could subject the principal to nearly unlimited legal liability. On the other hand, a grant of authority that is too narrowly worded may cripple the agent's authority to accomplish the principal's purpose. Define the territory in which the agent's authority is effective. Without a territorial limitation on the agent's authority, it is possible that a court could assume that the grant of authority is worldwide. If you intend to limit the agent's geographic authority, do so with specificity. List the basis for the agent's compensation. Although most agents are compensated using some type of commission arrangement, it is permissible to pay a monthly stipend. If all of the agent's compensation is time-based (rather than deal-based), however, a court may conclude that the agent is actually an employee rather than an agent. The classification of an agent as an employee carries several significant legal consequences for the principal, including no-fault liability for the agent's negligent acts in the course of employment. Compare your draft sole agency agreement with a sample agreement in order to identify any issues that your draft may have missed, such as taxes and insurance. Do not copy a sample agreement word-for-word--adapt it to your own requirements. Carnes, David. "How to Draft a Sole Agent Agreement." , https://legalbeagle.com/6133341-draft-sole-agent-agreement.html. Accessed 20 April 2019.